Most people are creatures of habit. I know I am. I try to maintain certain routines. I have a way of reading online that has evolved slowly but steadily over the years. Occasionally, I will make a great leap forward or sideways, such as when I dove into Twitter or started reading Alltop. But generally speaking, I’m a headline guy. And I get most of my headlines from my RSS feeds. 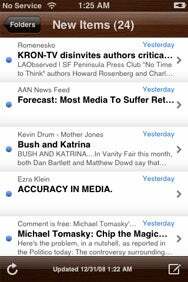 News junkies already know there is a superabundance of RSS readers for the iPhone and iPod touch. I praised Newsstand ( ) in October for its sophistication, ease of organization and graphic wit. It remains my RSS reader of choice. But I spent some time recently with Phantom Fish’s Byline, which syncs with Google’s RSS reader and lets you read your favorite feeds offline—and not just the feeds, but also the reference links. Subway commuters and frequent flyers will rejoice at Byline’s convenience in the absence of connectivity. What’s The Story: Byline syncs any feeds and folders you’ve created in Google Reader, letting you browse new items, starred items, folders, and notes. I didn’t do a direct comparison with Newsstand, although because Newsstand has nothing to do with Google Reader. I did, however, compare Byline’s features with Reader on Google Mobile App ( ). Byline compares very well. Byline’s interface isn’t quite as polished as Google’s in some respects, but apart from the excellent search, Google Mobile App doesn’t showcase Google’s other products and features especially well. Plus, the ability to read without a Wi-Fi or 3G connection, obviously, gives Byline a huge advantage. When you launch Byline, the app will automatically sync with your Google reader account and archive the new stories for convenient offline reading. (If you don’t want the app to sync automatically, you can switch the feature off in your preferences. The prefs also let you control how many stories will list—the default is a rather stingy 25, and the maximum is 200.) You can read the stories while the app is downloading, although there is a noticeable drop in speed. Byline syncs your feeds and any folders you may have created in Google Reader. The app lets you browse new items, starred items, folders and notes. Folders are really an indispensable part of the app. Without them, you face an undifferentiated list of headlines from every feed. The most recent version of Byline lets you mark all stories as read. The only thing Byline doesn’t do is sort feeds by publication or source; but then again, Google doesn’t do that, either. Byline has a couple of notable flaws. First, unlike Google Mobile App’s Reader, Byline truncates headlines, making long headlines impossible to read. I suppose this saves viewing space. But if you are a headline scanner, it is irritating. Second, Byline does not support Google’s sharing feature. I’m not much of a sharer—good grief, isn’t blogging and tweeting enough?—but many of my friends are. Their shared stories, alas, do not appear in Byline. Byline does allow you to share notes, however. To be honest, I never quite understood the need for this feature. You can e-mail links, too, which is invariably useful. Be aware, however, that the e-mail function does take you out of the app. Byline is a highly useful app, but not an especially handsome one. The wood grain background doesn’t evoke bookshelf or newsstand as much as the ’70s-vintage faux wood paneling in my father’s den. While Byline does support landscape mode (another option you can turn off and on in preferences), you cannot adjust the type size—a minor but regrettable flaw, as the typeface tends to be on the smaller side of readable. The bottom line on Byline: This convenient RSS reader out-Googles Google Reader with its offline archiving. It won’t replace Newsstand for me, but I’ll be interested to see what the updates have in store. Byline is compatible with any iPhone or iPod touch running the iPhone 2.1 software update.